How socialist are the socialists? 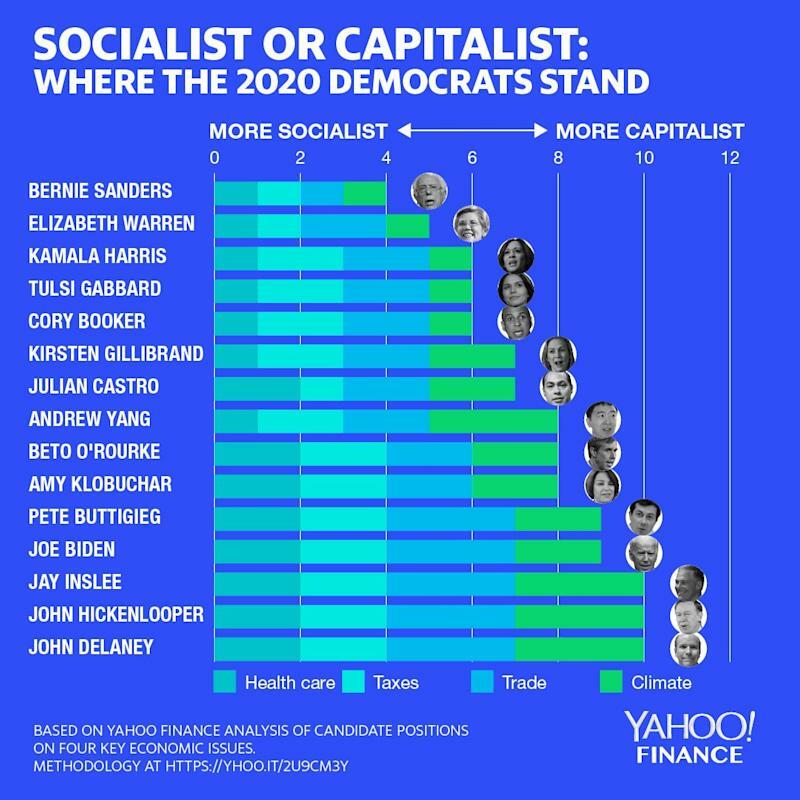 Sen. Elizabeth Warren insists she’s a capitalist who “sees the value of markets.” But an exclusive Yahoo Finance analysis of her policy proposals puts her on the more socialistic edge of the Democratic field, barely to the right of Bernie Sanders. Former Colorado Gov. John Hickenlooper, by contrast, has resisted efforts to label him a capitalist. Yet he lands at the more capitalistic end of the Yahoo Finance analysis, along with Washington Gov. Jay Inslee and former Maryland Rep. John Delaney. As the field of Democratic presidential contenders swells, the primary-election process is shaping up as a tug-of-war over what type of economy is best for the nation. Leftists want far more government intervention in health care, energy, transportation and other sectors, to address worsening income inequality. Centrists insist pragmatic, market-based policies can solve pressing problems. And some candidates claim to be one thing while backing policies suggesting they are something else. There are several useful takeaways for voters. It’s no accident that the two declared candidates with gubernatorial experience—Hickenlooper and Inslee—are at the capitalistic end of the field, since governors have to work with businesses to develop pragmatic tax and regulatory policies that generate jobs. Joining them at the capitalist frontier is Delaney, who made millions starting and running two successful businesses, and only ran for office after that. Sen. Bernie Sanders, not surprisingly, is the most socialistic candidate among Democrats, with a well-developed plan to sharply raise taxes, nationalize health care, cover college costs for many families and roll out other generous government benefits. Sanders has also signed on to the Green New Deal, which would border on a government takeover of the energy sector and force radical change in transportation, as well. At least 7 of these candidates—Sanders and Warren, along with Senators Kirsten Gillibrand, Kamala Harris and Cory Booker, plus Rep. Tulsi Gabbard and businessman Andrew Yang—support Medicare for all, which would essentially nationalize the health care industry and eliminate the private insurance that now covers nearly 180 million Americans. That might lower the total cost of health care, while covering more people, but it would also be massively disruptive and require sharp tax hikes. There are other ideas for working toward universal coverage with a broader government role, while keeping the private health care system mostly intact. On taxes, we considered plans to redistribute wealth through taxation—such as Elizabeth Warren’s wealth tax—as more socialistic. Politicians don’t often tout tax hike plans, but they do sometimes favor sweeping new programs—such as Sanders’ free-college plan—that necessitate higher taxes. We also rated those more socialistic. Tax hikes aren’t inherently bad, but economists generally say growth is strongest with the lowest possible level of taxation needed to meet public needs. And there are other ways to raise up those left behind, such as Delaney’s plan to incentivize investment in underperforming parts of the country. On climate policy, we consider the Green New Deal to be the most socialistic plan out there for addressing global warming. At least five of the candidates—Booker, Harris, Sanders, Warren and Gabbard—support the GND, which would put the government in charge of the much of the energy and transportation sectors and require large tax increases. In this instance, there are clear market-based alternatives that are more capitalistic, such as imposing carbon taxes and letting the market sort out the most efficient way to cut pollution. Inslee, who’s campaigning primarily on a “climate mission,” would push reforms down to the state and local level, end existing carbon subsidies (capitalistic!) and involve businesses in his crusade to reduce emissions. On trade, Trump-style protectionism is the socialist bookend, and only Bernie Sanders favors such an aggressive effort to protect American jobs by raising the prices consumers pay for imports. Trump has effectively, if mistakenly, vilified free trade, and few candidates these days are full-throated globalists. But Inslee, Hickenlooper, Delaney and to a lesser extent former Rep. Beto O’Rourke are all on record touting the virtues of open trade. Biden, as President Obama’s vice president, supported the Trans Pacific Partnership, which the Obama administration cultivated. Some of the candidates, including O’Rourke and former San Antonio mayor Julian Castro, haven’t spelled out their views on every one of these issues, so we analyzed past actions and other policy positions to estimate where they’re likely to fall on the socialism-capitalism spectrum. And Biden, widely expected to enter the race soon, hasn’t detailed his economic views since he ran for president in the primaries in 2008. Much has changed since then, and Biden will have to update his views to account for Medicare for all, the Green New Deal and other recent developments. We’ll track all the moves as socialism and capitalism duke it out over the next 20 months.